This post forms part of my series of blog posts for “Story Ideas“. Wings is an alternate history story. It doesn’t take place on a far off planet or magical realm, instead it takes place right here on our earth, at around 1000 BC. The plan is to pull actual historical events into the story so that what happens in the plot is “possible”, but I will add just enough fantastical elements to it to keep that sense of wonder. The fantastical elements are “explained away” in the end, making this alternate history possible. The year is 1000 BC, the Assyrian empire is a dominant force in the ancient world, but signs and rumors of it’s decline are spreading. In this time of uncertainty, an Assyrian warrior is sent on a secret mission under guise as a trade ship captain to investigate a rumor that, if found to be true, can turn the tide for the Assyrian empire and establish them for centuries to come. The trade ship embarks on it’s journey into unknown waters and is soon swept far off course by a strong wind that forces the ship farther and farther from land. Finally the ship is thrown and crushed on a ridge and all but the warrior, pretending to be a trade captain, drowns in the waters. The captain drifts to the shores of an unknown island. On the island, the captain is nursed back to health by what appears to be a warrior tribe of people. As he is introduced to their society, he learns much about this strange island. The first strange thing that he learns is that cats of all types on this island have wings and can fly, from the normal house cat to the wild cats that dwell in the jungles. He also learns that the island itself seemed to be sinking into the ocean year by year. The captain finds out more about the people who helped him, he learns in time that they crossed the ocean just like he did, but in pursuit of the ancient fabled Nephilim – descendants of both men and angels. The warrior tribe has one goal in life, to destroy the evil creatures which are the Nephilim, and wipe them from the face of the earth. As the plot unfolds even more, the captain realizes that the warrior tribe not only has to fight the giant Nephilim, but also their steeds, the very thing he went on a mission to find, ancient dragons. He soon finds himself in a position where he has to make a choice between his loyalty to his emperor and the sincerity with which the warrior tribe are trying to make the world a safer, better place. 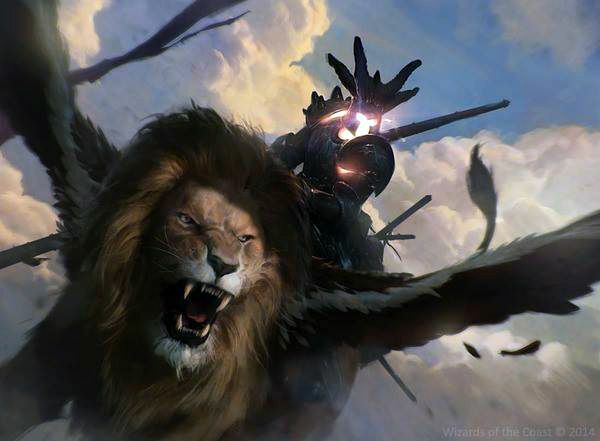 The final fate of the strange island and it’s inhabitants will be decided in the air, as warriors battle on winged creatures, as flying lions carrying noble warriors fight against giants riding on dragons. Cats are already pretty cool in themselves, so I kind of reckoned, why not give them wings?